I'm back and have some very exciting news! I know that I've been away for quite a while now and left some of you wondering what happened to me. Well I'm pleased to announce that I'm alive and yelping. Regular readers will know that my life is one adventure after another. I have so many stories to tell that I've decided to put them together in a book! Yes, that's right: this little doggy is writing a book! It may take me a little while, but I promise to be as quick as doggedly possible. I also promise to keep you updated with my progress. 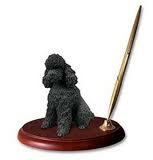 PS - Do you like my poodle pen?